^ a. Rhetorical question meaning "Those places where my homeland lies". 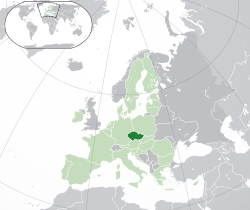 Sek Ripablik, o Jek Ripablik (Sekia o Jekia; Tok Inglis: Czech Republic, Czechia; Tok Sek: Česká republika, Česko) em i wanpela kantri long Yurop. Kantri we i klostu long em i Siamani, Polan, Ostria, na Slovakia. Kapitol bilong Sek Ripablik i Prague. Prague i bikpela taun tumas bilong Sek Ripablik tu. Tokples ofisel bilong Sek Ripablik i Tok Sek. ↑ Citizens belonging to minorities, which traditionally and on long-term basis live within the territory of the Czech Republic, enjoy the right to use their language in communication with authorities and in front of the courts of law (for the list of recognized minorities see National Minorities Policy of the Government of the Czech Republic). The article 25 of the Czech Charter of Fundamental Rights and Basic Freedoms ensures right of the national and ethnic minorities for education and communication with authorities in their own language. Act No. 500/2004 Coll. (The Administrative Rule) in its paragraph 16 (4) (Procedural Language) ensures, that a citizen of the Czech republic, who belongs to a national or an ethnic minority, which traditionally and on long-term basis lives within the territory of the Czech Republic, have right to address an administrative agency and proceed before it in the language of the minority. In case that the administrative agency doesn't have an employee with knowledge of the language, the agency is bound to obtain a translator at the agency's own expense. According to Act No. 273/2001 (About The Rights of Members of Minorities) paragraph 9 (The right to use language of a national minority in dealing with authorities and in front of the courts of law) the same applies for the members of national minorities also in front of the courts of law. ↑ 5.0 5.1 5.2 5.3 Czech Republic. International Monetary Fund. Retrieved on 21 April 2011. This page was last edited on 29 Me 2016, at 22:25.